There's 19 days 'til ChristmasWe're all getting ready here at Bloomex. As part of the run up to the big day, we'll be highlighting 12 items that make for great Christmas decorations. On the fourth day of Christmas, my true love gave to me... some flowers, the colour of candy! Red, green and white are the colours of the season and you'll find them in our beautiful Candy Cane Rose bouquet. This arrangement is very popular during the Christmas season, as it's a vibrant addition to any room around Christmas-time. 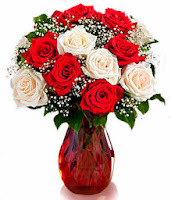 The bouquet comes loaded with six plump red roses and six white, evoking the sweetness of a candy cane. It's complimented by an assortment of festive Baby's Breath. Check out the product page here and join us on Monday for the next installment of Bloomex's 12 Days of Christmas series. Check out the previous editions below! There's 19 days 'til Christmas. We're all getting ready here at Bloomex. As part of the run up to the big day, we'll be highlighting 12 items that make for great Christmas decorations.